One of the most important accessories to buy is a digital guitar tuner. Digital tuners are any type of tuner that uses electronics to tune your guitar. There are two basic types: a guitar tuner and a chromatic tuner. 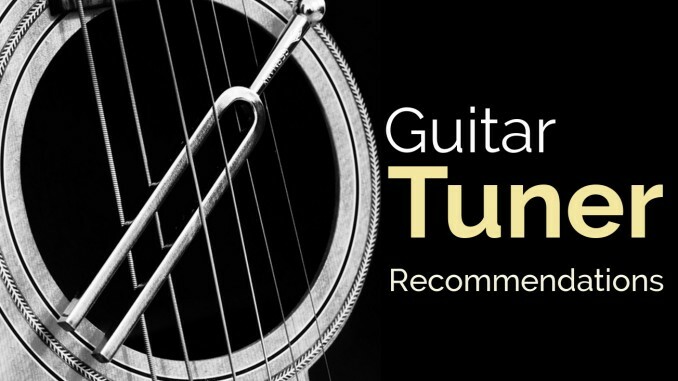 Simply put, guitar tuners only tune the notes of the guitar. Chromatic tuners will tune any note on any instrument. I like chromatic tuners so they can tune to any note. Personally, I recommend the Korg TM-50, which is the new version of the one that I own. It also doubles as a metronome. If you ever saw a rotating wheel that looks like it is going backwards or still, you’ve seen the stroboscopic effect, which is how strobe tuners get insane accuracy. They can tune within 0.1 cent of the desired pitch. This is insanely high accuracy. Most digital tuners are accurate within 1-2 cents. The human ear usually can’t tell the difference between 5 cents. However, when you play chords, smaller inaccuracies may be heard. Usually, you’ll hear a pulsating or throbbing sound. Strobe tuners start around $79. If you want the 0.1 cent accuracy of a strobe tuner, I recommend the Peterson StroboClip SC1 here. Standard unit – usually has a microphone and an input jack. Clip-on so it can be attached to your headstock when you tune. These usually don’t have an input jack. Stomp box – these usually don’t have a microphone. Apps and software – Tune through your computer, phone, or tablet with an audio interface. Built-into your amplifier – The amplifiers that I recommend have this feature. Built into your guitar – My acoustic electric has a built-in tuner. Not all tuners are the same. You want one that responds quickly to your playing. My first tuner cost me $10 and it would take at least a half second for the needle to move. It should move continuously. Some tuners use led lights to tell you if you’re sharp or flat. They can be good if their precision is good enough. Some do not have good precision. You want to be accurate within 2 cents. If the first LED is 5 cents off, your tuning could be off by a few cents. It doesn’t cost much more to get a great tuner. App tuners are convenient and often free (with advertising), but there is a big reason I recommend buying a stand-alone tuner. Simply, you are likely to drop the tuner on the ground. Would you rather drop a $30 tuner or a $300 phone? Also, there are a lot of variables to the microphone and audio input that may affect accuracy. With a stand-alone tuner, you know what you’re getting. Standard: Korg TM-50 Chromatic Tuner Metronome ($29.99) – Claims 1 cent accuracy. This is the new version of the one that I own and use. It doubles as a metronome for maximizing your value. Clip-on: Korg PC1 Pitch Clip ($19.99) – Claims accuracy within 1 cent too. Scroll down to see an awesome video with this tuner and Zakk Wylde. Strobe: Peterson StroboClip SC-1 ($79.99) – Claims 0.1 cent accuracy. If you don’t have a tuner yet, I highly recommend you buy one of the ones that I mentioned above. If you have one right now, find out the accuracy to see if you should upgrade. Staying in tune is job #1! If you need more gear recommendations, go to my recommendations page to learn about essential accessories and more. Now, check out this fun video of Zakk Wylde promoting the Korg PC1 PitchClip. These all are great list of fantastic guitar. Thanks for the good posting.